Help! 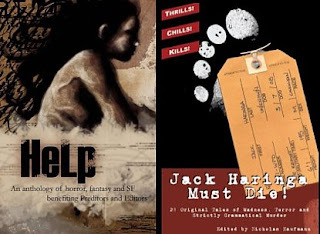 Jack Haringa Must Die! Lots of things happening/coming out all of a sudden. Help, the anthology to benefit Preditors & Editors in the lawsuit against them by PublishAmerica, et. al., which features my story, "Festival of the Jackal" just came out, as did Nick Kaufmann's Jack Haringa Must Die, which compiles a mess of dead Haringa blog entries, including a little booger titled "Woolly Solution," by this guy. The latest issue of Dark Discoveries magazine (#11) just arrived, along with the special Darker Discoveries chapbook, which includes my short-short, "Megan." A new Cemetery Dance with a new Rainey tale ("The Gaki") will soon be running rampant. And my newest collection, Other Gods, just hit the street in trade paperback format (the lettered and numbered hardback should arrive next month). This past week, most of my time was devoted to working on an outline for a pretty big project I hope to be undertaking during the next month. Can't divulge details at the moment, but I'll post them if and when the light turns green. Assuming I get the job, I'll be mostly in seclusion for the month of June—except for the weekend of the 13th through 15th, when I'll be in Indianapolis for Mo*Con III. Cemetery Dance #59 is finally on its way, featuring my story, "The Gaki." The issue's cover art looks mighty fun. Good company, too, except for maybe that Vernon chap from Nova Scotia. Also just received the latest issue of Dark Discoveries, and the chapbook published as a special-offer "extra," which includes my short-short, "Megan." Beautiful little package, this. Alas, I believe the chapbooks are all sold out, but if you're keen on wheeling and dealing, you might be able to dig one up somewhere. You can check out Dark Discoveries here. And me, I've been stranded on a desert island for the past couple of days. Well, not exactly stranded, and it wasn't really a desert, but it was an island nonetheless. Camped out with a bunch of friends at Deer Island, on Philpott Lake, Virginia, which is one of the most beautiful sites in the state. Hiked, made fire, piloted a Wave Runner (and didn't fall off, unlike some folks I know), ate well, drank beer, found geocaches. The latter activity involved tackling some of the most physically challenging terrain I've attempted in years—probably since I was a kid, as a matter of fact. The inclines I encountered were very long and damn near vertical. I did sit down quickly a time or two (which is preferable to slipping over a precipice), and fortunately came out only dirty rather than injured. Happily, the caches were unearthed, the logs signed. Now it's hard to work on this new project, for there is a deadline, and a tight one. It’s good to have wacky neighbors. Last night about 10:00 PM, my friend Paul calls up and asks if I want to go geocaching. I say yeah, so we head out to Lake Townsend Trail, which is pretty close by, and we embark on a late-night three-mile hike. Yeah, it was dark out yonder. Several times we had to bushwhack several hundred feet off the trail to find the caches, so I marked the trail with the GPS before setting out. Good thing I did, or we’d be out there still. Some potentially exciting news on the writing front. Can’t discuss it just now, but it’s a super project for me if all pans out. That makes a couple of biggies out there waiting in the wings; hopefully, one or the other (or both) will break before I grow really, really old. We shall see. Addendum: Just got a note from Dark Regions Press that the trade paperback edition of my new collection, Other Gods, is now shipping. The hardback editions will be out in another month or so (they’re printed and bound at a different facility). A smiley for me! ...without busting them at the seams. (The fact that most of the seams are already busted does not enter into this, thank you very much.) All this recent exercise is at least paying off in a few little dividends. Did get out to hunt quite a few geocaches these past few days; found several (coming up on my 200th find), and planted a new one tonight. In the midst of it, I started a new short story for a certain market. Got out to see Iron Man at the Eden Drive-in last weekend. Right fun, though it started raining for the last few minutes of the film, making it very difficult to see. But it was definitely a good time, and the drive-in cheeseburgers hit the spot. I have discovered that heavy-duty geocaching brings on a severe cheeseburger craving. I can has one pleez? You haven't seen Greensboro, the town where I live, until you've seen it from underground. Not that there's a lot to see in the pitch darkness beneath the roads, in a concrete-walled tunnel, with four inches of water trickling past your feet, a quarter of a mile from the nearest egress, somewhere beneath Fisher Park. After a time, the five-foot ceiling puts an uncomfortable, semi-permanent bend in your spine. You really, really hope your flashlight doesn't die. You have to keep a wary eye out for rats, snakes, spiders, and other potentially hostile indigenous life forms. I suspect this is not what a whole heap of local folks do for a good time late at night, but for my friend Paul and I last night, it was a blast. We found the geocache. I did mention to Paul's wife, Jamie, that our excursion was remarkably similar to a scene in my novel, Balak; I did not, however, tell her that, in the novel, things do not end well for the parties involved. It probably would not have been the right thing to say at the time. Addendum: A nice royalty check for Blue Devil Island arrived. Mighty good timing, I have to say. Though rife with many of the trappings of the classic horror tale, Kim Paffenroth's novelette, Orpheus and the Pearl (Magus Press, 2008), isn't what I would call "horror" at all. With thematic elements that hearken to Dracula, Frankenstein, and Herbert West: Re-Animator, Orpheus is a haunting tale that offers a few little chills and the occasional shudder, but above all, it's a story with a heart (and no, not just an organ yanked out of somebody's chest cavity). Set in the early 20th century, Orpheus opens with a scene reminiscent of Jonathan Harker's arrival at Castle Dracula, but here, it's a woman psychiatrist, Catherine McGuire, arriving at the dwelling of Dr. Wollston, a highly regarded physician/research scientist who faces an unusual moral, ethical, and practical problem: his young wife is recently deceased, but he has found a way to revive her to a state that resembles life. While her "soul" remains intact, preserving her body requires extensive measures, and her mind has suffered unexplainable damage by the ordeal of dying and resuscitation. Most significantly, she is prone to fits of extreme rage, with a corresponding amplification of physical strength and appetite. It is this problem that Dr. McGuire has been summoned to address. Tension begins on page 1 and undulates snakelike behind every scene. Just how does one understand, psychoanalyze, and "cure" someone who is technically dead? Mrs. Wollston is not a mindless zombie, yet her presence inspires the kind of fear one might feel in the presence of a wild animal — an animal that might, at the slightest provocation, rip your throat clean out. As Dr. McGuire interacts more closely with Mrs. Wollston, we, as readers, gain increasing insight into this weird state somewhere between life and death, rendered by Paffenroth in alternating shades of clinical detachment and emotional intensity. The characters drive the story to a moving climax and a resolution that is at once hopeful and bittersweet. Paffenroth's crafting is mostly masterful, yet all is not quite perfect in this novelette, for the occasional turn of a phrase clunks like a B-flat that should have been an F-major-seventh, and I'm not sure it's due entirely to the style of the telling. One line in particular slammed my reading to a stop and even now, it feels as ugly as scraping my fingers across a cheese grater. It describes "a wide, narrow window," followed by its approximate dimensions. This sentence could have breezed right to the portal's dimensions, leaving out the "wide, narrow" bit, and suffered not a smidgen of harm. Perhaps I nitpick, but this stood out sufficiently to make me remember it long after the fact. Thankfully, such gaffes are few in number, and none other so grievous, and when Paffenroth's prose is elegant, it is the very definition. I'm going to recommend Orpheus for a Stoker as well as to you folks who are dying for a story that is both tense and touching. In my fairly long experience of reading dark fiction, I've too often found the latter quality deficient. Orpheus makes up for a mess of it. Friday was my 49th birthday, but I'm actually breathing pretty well (I seem to have successfully stopped smoking, but for a handful of cigarettes here and there since January). Since Friday, I've barely spent a moment indoors, having gone out and about on numerous caching expeditions (both finding and planting); trekked up to the old homeplace in Martinsville; spent an evening around a campfire in the woods; hiked a few miles just for the helluvit; and hung out with my brother, my wife, and old friends. The old bones are a little achy from the exertions, but a bit more hiking this afternoon followed by an evening martini will almost certainly fix it. I received tons of happy birthday wishes, for which I'm grateful, and I'm slowly but surely sending out little thank-you notes. Hopefully I won't miss anyone, but if I do and you drop by here... mini tanks. It means a lot when people take even a few moments to acknowledge one of these little landmarks. As for the one day closer to death thing...well, guess it kind of goes with the territory of living. Today is my brother's birthday, so I guess I'll celebrate a bit more and maybe pilfer one of his gifts, just because it's a personal tradition.